• The Friends of Seaford Wrestling are Proud to Sponsor a Wrestling Clinic by Jack Mueller June 8, 2019 in AM. Special arrangements have been made with Walt Whitman that will allow a wrestler to attend both the clinic and Vin Altebrando tournament at Walt Whitman. 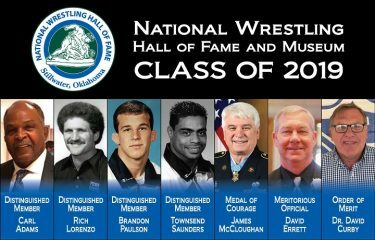 • National Wrestling Hall of Fame Announces 2019 Inductees as Distinguished Members Including Former Brentwood Wrestler and Boston University Coach Carl Adams. Information on attending this years ceremony can be found by Clicking Here. • Hewlett HS has a paid wrestling coaching position available at the HS level for this upcoming season. If you know someone who may be interested please have them contact Steve Jones at 516-220-3773. If we find the right candidate he can begin coaching with us this spring season. • Islip will be holding a Suffolk Satelite weigh in for the MAWA East Region Qualifier at Fair Lawn. All wrestlers must be preregistered through www.wrestlereg.com prior to weighing in. The weigh-ins will be hosted at Islip High School from 4-5 on Friday, March 22nd. Enter school through the east entrance. Questions call KC Beach 631-365-1061. • Manhasset will be holding a Satelite weigh in for the MAWA East Region Qualifier at Fair Lawn. All wrestlers must be preregistered through the www.wrestlereg.com prior to weighing in. The weigh-ins will be hosted at Manhasset High School from 3-5 pm on Friday, March 22nd. Enter school through back entrance. Questions call Stephon Sair 631-897-7417. • Senior New York Team heading to Pittsburgh Thursday. Nationally ranked Joey Slackman (ranked 11th) slated to wrestle Jake Slinger (ranked 13th) and could decide the match between NY vs WPIAL. These will NOT be updated throughout the weekend. Updates can be seen by clicking LIVE BRACKETS & RESULTS in the center of the Home page. • If you want to reward my efforts on the website by donating to my favorite charity and don't have a Facebook account you can click here to donate by PayPal or Check. • Newfield’s Hunter Hughes earned his 100th career varsity win Saturday at the Suffolk County Wrestling Championships. • Nick Shimkin from South Side/East Rockaway recorded his 100th win in his first match of the Section VIII Division I tournament Saturday. • Sean Peterson from Islip received his 100th career win this past weekend at the Suffolk county championship. • Max Yahre of Plainview earned his 100th win at the Section 8 D1 tournament Sunday. • Mike Blando of Massapequa received his 100 career win at the Nassau 8 county tournament. • John Casamassina of Massapequa received his 100 career win at the Nassau 8 county tournament. • Elijah Rivera of Bay Shore got his one hundredth win at the Suffolk county tournament. • Sean Flick of St. Anthony's earned his 100th career varsity win at the CHSAA Wrestling Championships this past weekend. • Tickets for thge NYSPHSAA State Wrestling Championships in Albany are on Sale Now at Ticketmaster NOT GoFan. It is also not $8 online like the NYSPHSAA website says. It is $10 a session, so the online price is no different than the onsite price. Unfortunately that means a $30 All-Session pass comes to $45.90 with Fees and Mailing. Not sure if fees are added if you buy at the door instead. • Joe Feola from Walt Whitman recorded his 100th win at the League 2 Tournament of Saturday. • Jay Montagna 126lber from WHB achieved his 100th win in the first round of leagues Saturday. • Will Obert-Thorn recorded his 100th win at the League II wrestling championships this past weekend. • Jake Marine of Calhoun reached his 100th win in the finals of the qualifier Saturday at Bellmore JFK. • Tom Fitzsimons of Ward Melville achieved the 100 win plateau in the finals of the League 1 Championship Saturday night. • Newfield's Nick Calderone earned his 100th career varsity win in the semifinals of the League 4 Championship Saturday night. • At the league 6 Championship Saturday Logan Delisle of Islip earned his 100th win. • Rick D’Elia of Port Jefferson recorded his 100th win at the Huntington Multi Team Dual tonight. • Adam Quintanilla of Lindenhurst HS got his 100th win a week ago Saturday at the Lindenhurst Round Robin Tournament. • Steven Wilkinson of Connetquot HS posted his 100th win this past weekend at the Wes Dolson Memorial Tournament at Mattituck. • Jeremy Scutellaro of Massapequa HS got his 100th win in the semifinal match against Fulton at the NYSPHSAA Dual Meet Championships. • Preston Maucere of St. Anthony's had the Match of the Night and got his 150th win in the finals of the CHSAA State Dual Meet Championship. • Francis Whitehouse of Islip HS picked up his 100th win tonight against North Babylon. • Michael O’Brien from Mt. Sinai HS posted his 100th career win on Saturday at the finals of the Section 11 D2 Dual Meet Championship against John Glen HS. • Ray Costa of Cold Spring Harbor scored his 150th win at the Section 8 Dual Meet Championships in the dual against Seaford this past Saturday. • Sign up for the NFHS Network and watched streamed events like the NYSPHSAA Dual Meet Tournament and Individual State Championships for $9.95 a month. • Matt Campo of Mt. Sinai scored his 152nd win at the Comsewogue Duals this past Saturday, breaking the Mt. Sinai High School all time record from 23 years ago. • NYSPHSAA Dual Meet Championship Tickets Now on Sale! • Liam McIntyre became Westhampton Beach's all time winningest wrestler this past Saturday at the Balwin tournament. He now has 154 wins. • If you are attending the Dual Meet Championships in Section 8 or Section 11 make sure to purchase your tickets online to save time and money. Online sale is discounted. Info is on the High School page. • Jett Tancsik of Centereach posted his 100th career win at the Copiague Tournament this past Saturday. Jett is the first Centereach wrestler to reach this milestone. • Dalton Otto from Connetquot HS also got his 100th career win at the Copiague Tournament this past weekend. • Stefan Major from Kings Park HS reached a new milestone when he got his 150th career win with his 3rd Place finish at Eastern States. • Joseph O'Brien from Mt. Sinai HS reached the 100th win career mark against Brentwood on Friday night. • Center Moriches Sophomore, Jordan Titus, earned his 100th win this past weekend at the Eastern States where he placed third. • Tickets for Nassau and Suffolk Post Season events can be purchased online. Click here for info. Suffolk's are cheaper if purchased online instead of at the door. • 12th Annual Lindenhurst Youth Wrestling Tournament, This Sunday, The same outstanding wrestling tournament upgraded with WAR Zone pairing on Full competition mats. • Sal Guastella broke the Glen Cove win record Wednesday night at Hicksville. He recorded his 111th career win surpassing Sasha Bogdanich (110 wins) for the most all time wins in Glen Cove. • Deaquan Stuart became Roosevelt's first ever wrestler to achieve 100 wins this past weekend at Hickville's 3rd Annual Comet Classic. He earned his 100th win in the semi finals and 101st in the finals capturing the 220 pound title and MOW for the day. Click here to join the LIWA! 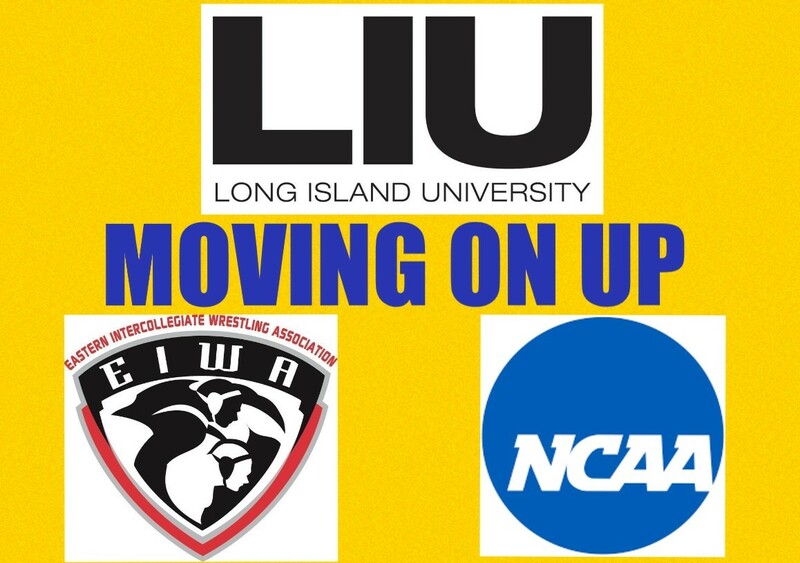 of LIU Post moving up to NCAA Division 1. To join in the celebration click here ..
Join the local LI/NY Metro Chapter today by clicking here .. Looking to collect any old Section 8 County Wrestling Tournament filled in brackets. Also looking for past NYSPHSAA State Tournament programs and NCAA Wrestling Championship programs. If you have been looking to clean out your attic or garage and don't know what to do with your old programs here is the answer. Mail them to Steve Meehan 117 Dale Dr, Oakdale NY 11769 or drop them off @ 117 Dale Dr, Oakdale NY 11769 or give me a call and I'll come pick them up if you have more than a few. The Long Island Wrestling Association is a voluntary, not-for-profit organization dedicated to fostering, promoting and encouraging the sport of amateur wrestling on Long Island as a means of building character, physical health and well-being, sportsmanship, self-confidence, self-esteem, and positive attitudes about dedication, persistence, intensity and hard work among the younger generation in order to fit them more adequately for their future role in society. If you think we are heading in the right direction or just enjoy the website please become a member of the Long Island Wrestling Association. Click here to join! To assist young people to compete in the sport of amateur wrestling by sponsoring tournaments and competitions for wrestlers and clinics for wrestlers and coaches. To assist and facilitate the creation, development and enhancement of youth wrestling programs. To assist and facilitate the dissemination of information about wrestling events and activities to wrestlers, coaches, parents and fans. To assist and facilitate the creation of a travel club to allow wrestlers to attend wrestling camps, clinics, competitions and tournaments in other geographic areas. To assist wrestlers in obtaining USA Wrestling membership cards to allow them to participate in USA Wrestling sponsored events. To assist and facilitate the creation and development of work programs, summer and part-time internships with various Long Island and New York City corporate sponsors. To assist and facilitate the creation and development of a foreign student/wrestler exchange program. To encourage parents and fans to volunteer their time to assist in the development of youth wrestling programs. To assist and facilitate the dissemination of information to the general public about the sport of wrestling. To enhance and support media coverage of wrestling events. To assist Long Island wrestlers in attending the Olympic training camp and in competing on a national and international level. 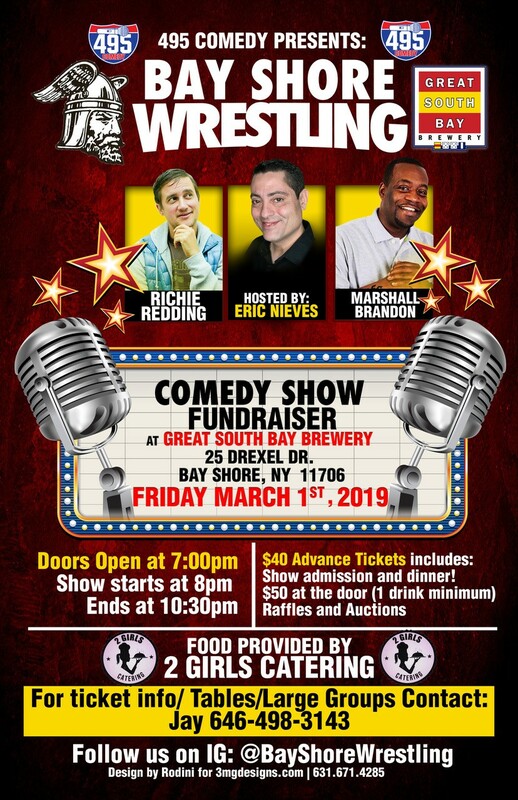 To offer membership to the general public in the Long Island Wrestling Association, Inc. and to collect membership dues and other contributions from such membership. To solicit and collect contributions from individuals, groups, business and social organizations, corporations, foundations and governmental entities in order to finance the activities of the corporation. Downloadable High School action photos. When you see a ? in the list of teams, it means the coach has been asked who is in their tournament and hasn't responded. Events will remain listed here until individual tournament results are sent to me or dual results are entered in Trackwrestling and sent.